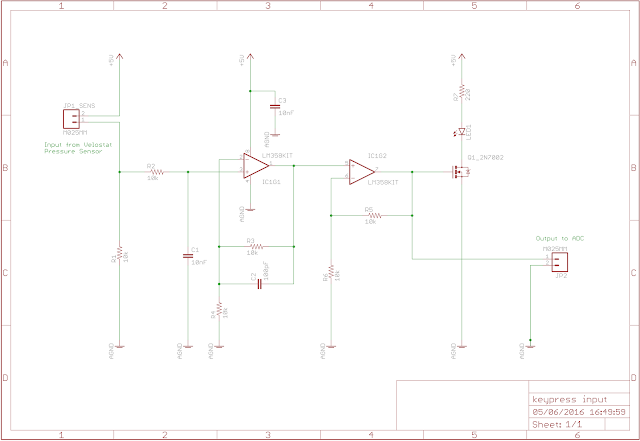 In the previous post I designed a circuit which was supposed to read in when pressure was applied to a custom sensor made from velostat. 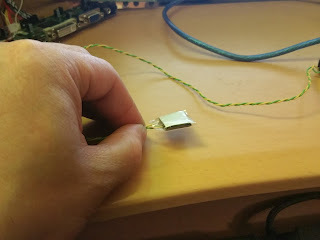 I made a sensor out of some single sided FR4 printed circuit board material, some foam tape, two pieces of wire, a small 1 cm x 1 cm piece of velostat and some sticky tape! This is just a prototype and may not be my final version of the sensor. I wanted to see how well velostat worked and how it would behave. It seems to work really well! 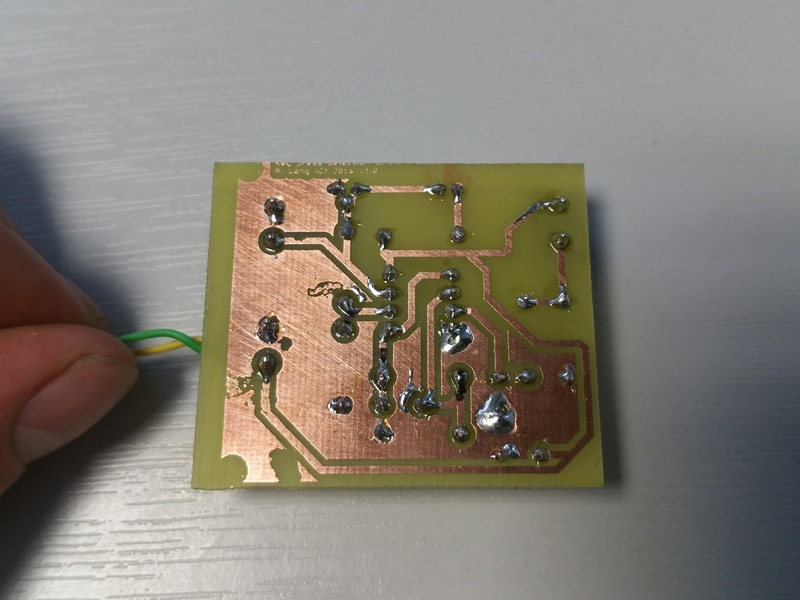 I found from measurements with my multimeter that when the pressure sensor is not touched the resistance across the wires is 30 kΩ. When pressure is applied it drops to 1 kΩ. 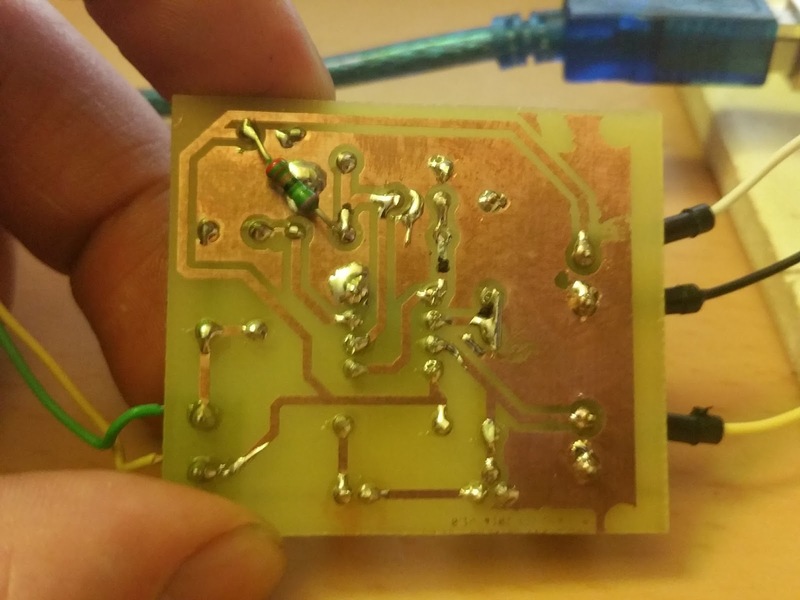 That should be more than good enough for the purposes of detecting a key-press! 30 kΩ and varies down from that when pressure is applied. Because of this I need to tweak my circuit from behaving as a two stage buffer to a simple analogue comparator and buffer. Luckily it won't be too hard to change things! The new circuits works in a similar fashion as the previous one. The velostat pressure sensor makes up a voltage divider. The output of the voltage divider is connected to an analogue comparator made with the first op-amp in an LM358 dual op-amp IC. 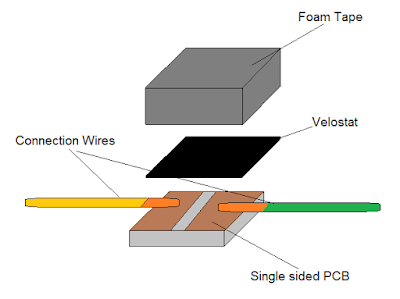 The negative input has a 2.75 V reference set by the 8.2 kΩ resistor and the 10 kΩ resistor. 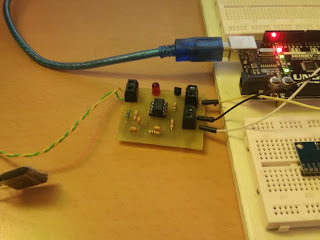 The output of the 1st op-amp is then connected to a buffer amplifier with a gain of two and then the output is connected to a FET and an LED. 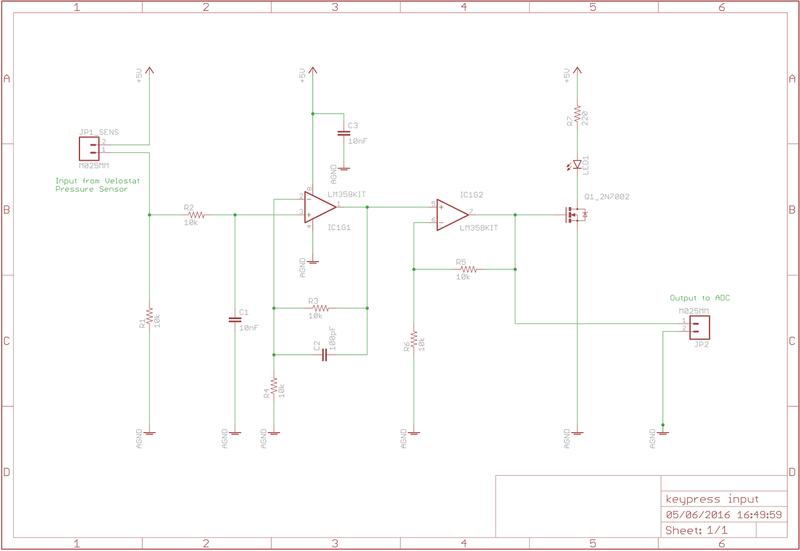 The output will be sent to the ADC of the micro-controller which will probably be an Arduino. Here is the modified PCB layout although I probably won't etch this board again. 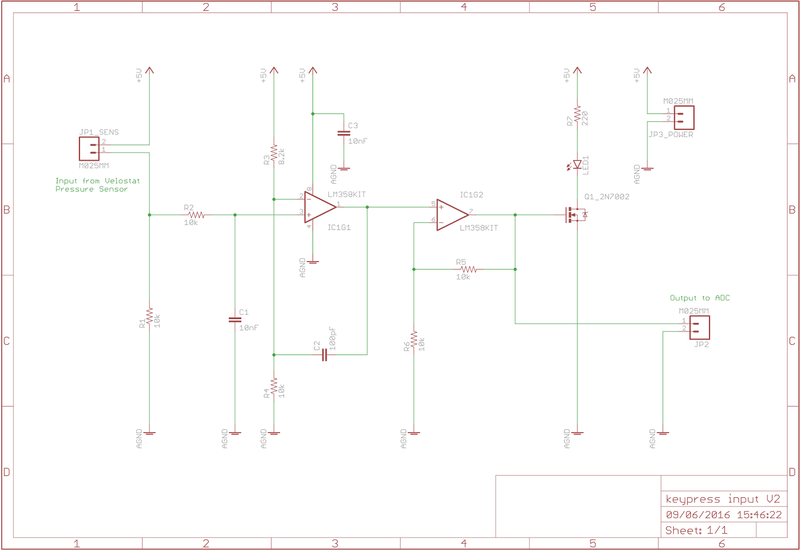 I'm going to re-design it to use surface mount components and be a smaller form factor. It would be nice if each board fit snugly under each piano key. Here is a graph I made from the serial monitor results. It looks very similar to the simulated oscilloscope trace from the first post! 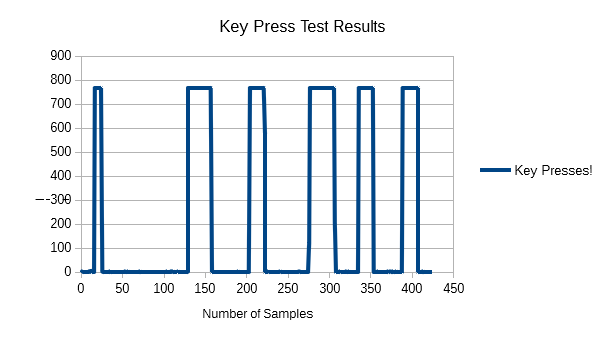 So now we have a valid method of reading key presses we need to scale things up - and shrink a few things down. 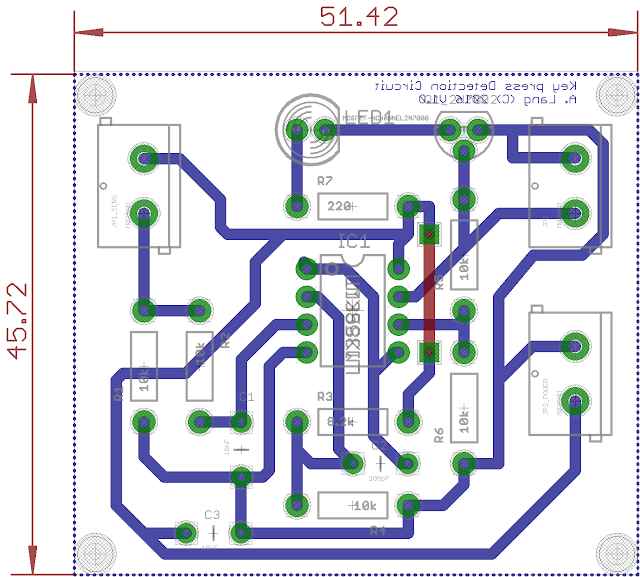 I will redesign the key press PCB layout to use surface mount components to take up as little room as possible. Then we need to look at multiplexing all of the signals together...and for that I'm going to use the 74HC4076 integrated circuit breakout board. That's all for now people - take care!